I like Karen Armstrong's books. Have you read "A History of God"? 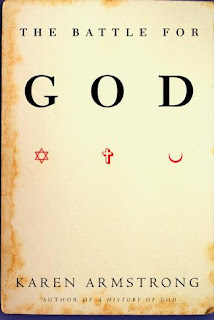 It's a really informative but easy to read account of the history of the three monotheistic religions. Sounds very interesting. I've heard of this one before, but wasn't quite sure what it was all about. I wonder if the conclusion that the myths were taken metaphorically comes from the fact that the myths were repeated (many aspects of the Jesus story are a repeat of some Egyptian mythology, for example). Surely, if people re-purposed these myths, they recognized them as myths... and not as events that happened literally over and over again. I don't know... It's just a theory. You might like a book called The Fall by Steve Taylor. It talks about monotheistic religion, but more about why it arose in the first place (and the problems that came with it). It's one of the most fascinating non-fiction books I've ever read. La Coccinelle- You may have a point about that. In fact, it is possible that the very fact that people allowed themselves to evolve new religions from older ones might indicate an implicit acknowledgment of the non-literal nature of their myths. On the other hand I don't think you can discount the possibility that a number of early practitioners of, say, Christianity were unaware of the Jesus story's similarity with Egyptian mythology. I'm not saying that they necessarily spontaneously came up with a similar story on their own, just that there is a possibility that a number of the early followers might have been unaware of the myth re-purposing that has gone on. Thanks for the recommendation. I've looked it up and it does sound fascinating. I'll check it out. I think that religion was created not only to police when no police existed but also to explain the unexplainable. The problem with fundamentalists, I think, is that they see the world in black and white. If you don't agree 100% with me than you're 100% wrong. I'm not the smartest guy around but I certainly recognize that our world is built from shads of gray. I've been shying away from Karen Armstrong's books because I worried that she might be too smarty-pants-ish for me, and I was worried about how biased she might me. But it sounds as though she tries to be objective at least, so maybe I'll give her a try soon! Man of la Books - Oh yes, in fact, Armstrong's "religion as mythos" argument is that religion explains the unexplainable. And I'm definitely a shades-of-grey person myself, for better or for worse (better, I hope). Sarah - I was worried about the bias too. But no, she definitely tries to be as objective as she can, and she tries to treat each religion with an equal amount of respect. Hope you like her stuff, if you do decide to give her a try.